The community of Kivaa is located northeast of Nairobi. 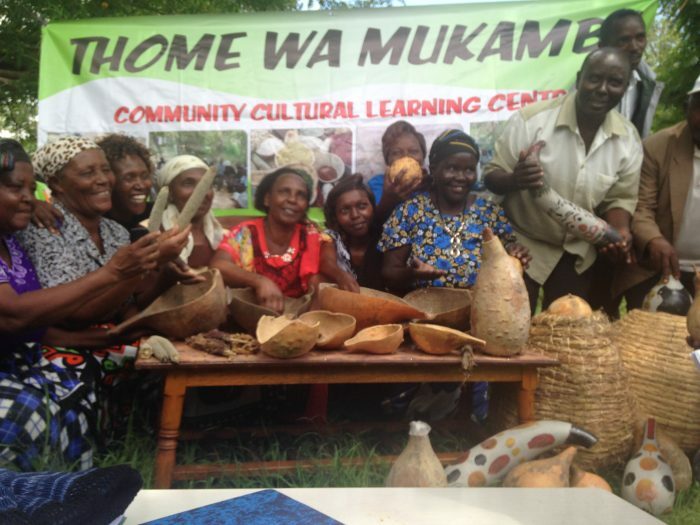 There, the Institute of Culture and Ecology (ICE) with more than 150 men and women farmers, teaches about traditional seeds and their conservation. I visited Kivaa with a delegation from the Agricultural Biodiversity Community (ABC). Arriving at this community was one of the most magical experiences I had in my adventure through Africa. Upon arriving, we were met by a group of women who sang to us as we got out of the truck, and embraced us warmly, I felt as though I had come home. After welcoming us and saying a prayer asking for a successful meeting, they explained their seed conservation work. This project is led by the elders of the community, both men and women, knowledgeable in the cultivation and conservation of traditional seeds. Leading us to a table spread out with seeds, they showed us varieties of millet, sorghum, caupí (Vigna Unguiculata) and gandúl (Cajans cajan), and explained that they eat them mainly in pies and a sort of pudding as a source of carbohydrates and protein. In order to preserve the seeds, they mix them with ashes, place them inside containers made of gourds and then place them in large baskets made of straw. They tie up the larger seeds, such as sorghum and corn and store in the kitchen above the wood oven. Throughout our conversation it was clear that the women were the ones in charge of taking care of the seeds and of everything that took place inside the home. “And what do the men do?”, someone was bold enough to ask. “And who does the land belong to?” someone else asked. “The ownership of the land is the men’s, but the man cannot dispose of the land without the consent of his family, but things are changing, now women can inherit land from their fathers,” they noted. “What are you doing to confront those challenges?”, someone else asked. After this the visit came to an end. We took our leave of this community in the midst of songs and dances. It is important to point out that, thanks to the struggles of the social movements and of civil society, in Kenya the planting of genetically modified seeds is prohibited. Nevertheless, the economic pressures and the political lobby to lift such bans are enormous. It is important to point out that, thanks to the struggles of the social movements and of civil society, in Kenya the planting of genetically modified seeds is prohibited. Nevertheless, the economic pressures and the political lobby to lift such bans are enormous. The initiatives like those of Thome Wa Muamba are key to increasing the resilience in the face of extreme climate phenomena, for example long droughts, and to ensure the access to material that is genetically adapted to the environmental conditions of the zone. *This is the second part of the series entitled: ‘Africa at the Crossroads: Is Sustainability Possible?’ written after a visit by the author to Kenya to participate in the general meeting of Agricultural Biodiversity Community ABC in November 2015. It was originally written in Spanish and kindly translated by a volunteer of the translation team of Food First. The author is deeply thankful to the anonymous translator.